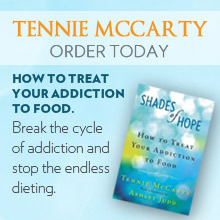 As the Founder, CEO and co-owner of Shades of Hope, Tennie brings over thirty years of combined professional and personal insight to the treatment of eating disorders and addictive diseases. She was the first Program Director at Serenity House in Abilene, a position she held for nine years. Seeing the need for an all-addiction treatment program, Tennie and a partner founded Shades of Hope in 1987 as a treatment center to address multiple addictions including eating disorders, alcoholism, chemical dependency, sexual addiction, self-injury histories and codependency. Tennie speaks several times each year to professional groups throughout the country, including being asked to address Kentucky’s American Medical Association in 2008. In recovery herself and the mother of a recovering anorexic, Tennie has a unique insight into the nature of disordered eating. Her expertise manifests itself through her work in anger reduction, family sculpting and week-long intensive eating disorder workshops. She is the author of the best-selling book Shades of Hope: A Program to Stop Dieting And Start Living.